Intel® Omni-Path Director Class Switches, an element of the Intel® Scalable System Framework, are part of an end-to-end product family for HPC fabrics that delivers high performance with breakthrough cost models. Intel® Omni-Path Architecture (Intel® OPA) builds on proven technologies from Intel® True Scale Architecture, the Cray Aries interconnect, and open source software to provide an evolutionary on- ramp to revolutionary new fabric capabilities. Intel® Omni-Path Director Class Switches deliver 100 Gbps port bandwidth with latency that stays low even at extreme scale. Based on new Intel 48-port switch silicon, these switches can lower fabric acquisition costs by as much as 50 percent, while simultaneously reducing space and power requirements. With these savings, you can potentially achieve higher total cluster performance within the same hardware budget to expand and accelerate your research. Intel® Omni-Path Director Class Switches support HPC clusters of all sizes, from mid- level clusters to supercomputers with tens of thousands of servers. 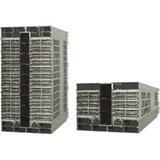 You can use these switches in combination with Intel® Omni- Path Edge Switches to build low-latency, multi-tier fabrics with an exceptional set of features for high-speed networking.